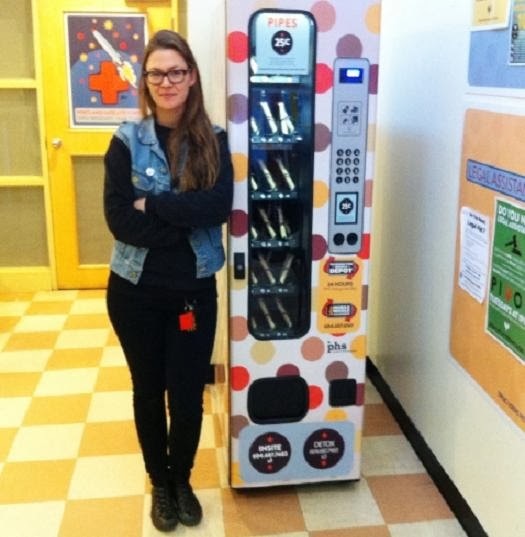 The Vancouver Province is reporting that Vancouver is now home to Canada’s first crack pipe vending machines. This is the flaming example of everything that is wrong with this country. The DTES is a failed social experiment. Perpetuating that failure is not social justice. It is not compassion it is heartless brutality. This is not the New York model. Bragging about crack pipe vending machines is the epitome of stupidity. Crack is a highly addictive poison that destroys lives all on it's own. On top of that it is cut with superbuff which gives you flesh eating disease. The only one who benefits from these insane vending machines are the drug dealers that torture and murder drug addicts for drug debts. What the hell is the Drug Users Resource Centre? Do they get tax dollars like VANDU does? That is a criminal insanity. I guess it would go under "Tools and Technology"? Unbelievable. This confirms that BC GOVERNMENT is supportive of Drug Trafficking Crime & it's part in supporting the ECONOMIC BC ENGINE! It ain't just the BC Gov....this stupidity goes much higher then that.